A gunman opened fire at an Oregon community college Thursday, killing at least 13 people before he died during an exchange of gunfire with police, authorities said. Douglas County Sheriff John Hanlin said the 20-year-old gunman was killed during an exchange of gunfire with officers. The sheriff did not say whether the shooter was killed by officers or took his own life. Oregon Gov. Kate Brown said the shooter was 20 years old. 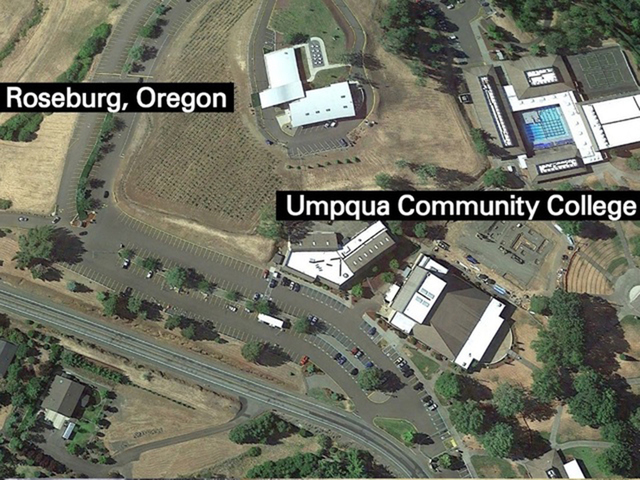 We are responding to the active shooter incident at Umpqua Community College in Roseburg, Oregon. Witnesses saying shooting isolated to one classroom: a writing and/or speech class in Snyder Hall. "I suspect this is going to start a discussion across the country about how community colleges prepare themselves for events like this," he said. Associated Press writers Steven Dubois in Portland, Oregon; Martha Mendoza in Sana Cruz, California; and Gene Johnson and Donna Blankinship in Seattle contributed to this report.